Animation students attend US Premiere! For the first time, students at Thomas Starr King Middle School, trained for and competed in the MathCounts South Bay/Santa Monica Chapter Competition held on Saturday, February 25th. Thomas Starr King MS is competing for a $25K grant to send students on field trips to enrich the curriculum, and also to enhance science, technology, and math instruction. Be sure to vote every day for our school by visiting MyScholarDollars.com starting on March 1st until March 24th and help us secure these funds! Click on Vote Now, Pick Thomas Starr King Middle School and Vote! You will be prompted to enter your first name, email and zip code. At King we celebrate African History Month in February. We encourage students to wear African inspired clothes on the last day of the month. Students build and program ANTY, the robotic ant. 'The Lego Batman Movie' Premiere Screening! Animation Students attend black-carpet premiere! A Special Thank You to our Students and History Teachers!! Free Dress Day Feb. 27th! King Middle School was credited with over a 94% percent participation rate! We are the highest rated middle school and also the highest rated secondary school in all of Local District Central! Thanks to all of our students and History Teachers for the tremendous job in completing these surveys. As a show of our appreciation, we will be offering our students a free dress day for this Monday, February 27th, 2017! Each Title 1 school in LAUSD is required to develop and write a Parent Involvement Policy and Parent Compact. Links to the documents are provided. Parents will also receive a Parent Involvement Policy in the mail. SLAM! (After School Music Program) - Winter Session Starts Soon!!! Click on the link/pdf for details. Meet Thomas Starr King's Granddaughter, Ms. Ginny King! Our own Ms. Allison Ceasar met with Thomas Starr King's granddaughter at the Los Angeles County Museum of Art (LACMA). Seen in the picture, from left to right, Ms. Allison Caesar, teacher, Ms. Ginny King, Thomas Starr King's granddaughter, and Albert Valdez, Director of Education at LACMA. 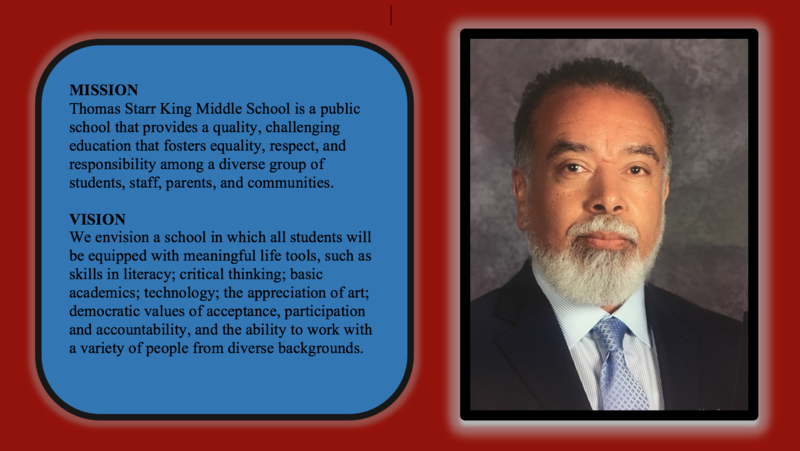 The Los Angeles Unified School has adopted a new Middle School Culmination Activity and Certificate Completion policy effective starting with the class of students culminating in 2017. This policy defines the criteria for issuing a Middle School Certificate of Completion and for students to participate in the Middle School Culmination Activity. It supports student achievement and guides students in preparing for matriculation from middle school to high school. Download a copy of the entire policy on PDF by clicking on the title above. Mr. Ward's 3rd Published Book is hot off the presses! Red Carpet U.S. Premiere for Paramount Pictures 'Arrival'! Effective November 1st, important items being dropped off (including homework, PE clothes, binders and backpacks, lunch, projects, and/or miscellaneous school-related items) must be received at our school no later than 9:00 a.m. Additionally, students can pick up these items only if you notify them in advance. Subject to change. Please check our web calendar for updates. We finished first in number of votes! Next, a jury will evaluate the top ten entries and announce a winner on December 6th. Fingers crossed!!! What a fantastic get-out-the-vote effort from our large King family. We voted and reached out to our community. And it paid off!!! Special thanks to King parent Emiliana Dore, who wrote the grant for our school and made it all possible!!! For dates and additional information, click on the title.